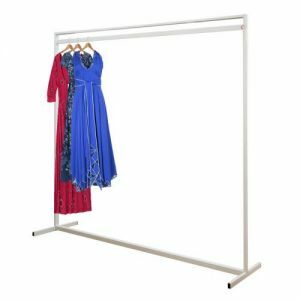 British designed British made Deluxe Stylish Solid Steel Extra High White Garment Rail. Powder coated. Customer Review: I use all the hangers extensively they are great value & quality. I simply cannot praise them highly enough. Customer Review: Very good quality hangers. Items do not slip off when in the wardrobe. Especially good for drying sweaters without the 'bulge' that some hangers can cause on the shoulders. Definitely recommend. Customer Review: I love these hangers they hold my expensive clothes without marking it. I intend to buy more to hang all of my clothes.